HANAKA is also join a part in the event! And what`s the good news!If you join this event wearing the kimono is HANAKA, you may get lots of discounts as you want! Venue： Ueno Park　Going by Ginza-line from HANAKA is only for 15mins! 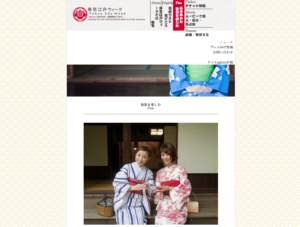 ※There is also special plan from HANAKA to those customers who are going to the Tokyo Edo Week. Also,the cost will be the same for those customers who come with their own yukata. It is also albe for you to buy a yutaka. Pleases check out the detail from the Tokyo Edo Week `s homepage.